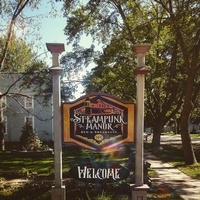 Steampunk Manor Bed & Breakfast is a themed Bed & Breakfast! 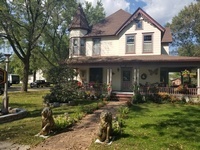 The Queen Anne Victorian Home built in 1904 adorned with beautifully carved antique woodwork and is in historic Spring Green. Enjoy the outdoors with our welcoming wrap around porch furnished with a cozy swing, bistro tables and comfortable armchairs or stride into our Saloon Room grab a cocktail and challenge another guest to a proper game of chess.